This week's One Layer Wednesday challenge is being hosted by Cheryl. The challenge is to make a holiday thank you. I love the pops of colour and the way the letters look like they're behind the tree, due to the masking, but I'm still not sure. So I went back to my original idea, but used the 'a', which, conveniently, looks something like a Christmas tree. I like them both, but definitely, each has its own feel. It amazes me how one little decision can make such a big difference. 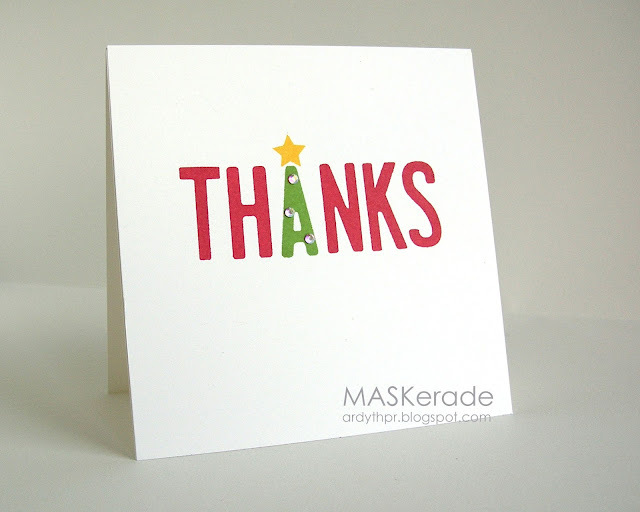 And if you notice, I still haven't done the solid green triangle (my original idea) - I could probably make all my Christmas thank you cards using this basic idea, and still have no two the same! I love this hobby! Love that first one! So clever! Wouldn't want to have to choose! The first one is definitely clean & simple in a contemporary way; the second one is clean & simple with a whimsical, almost Dr. Seuss look. Love both of these cards! Loving the bright, cheery ink colours - gorgeous! Great cards! I think the first one is my fave - that A tree is so cool! Ardyth you are rockin' out the thank you cards. Excellent. Fantastic holiday thank you cards, Ardyth! Brilliant use of colors, as always!! Love the first card and ho-ho-ho what a treat to scroll down and find the second one, too. Beautiful coloring. I love this hobby, too, because I dislike making the same thing over and over, and with paper you can change one little thing and get a whole new look. For example: your fabulous cards. How clever Ardyth! I love the first one..... Just adorable! Both are terrific and very clever!!! Love them! So HAPPY you're playing along with us Ardyth! 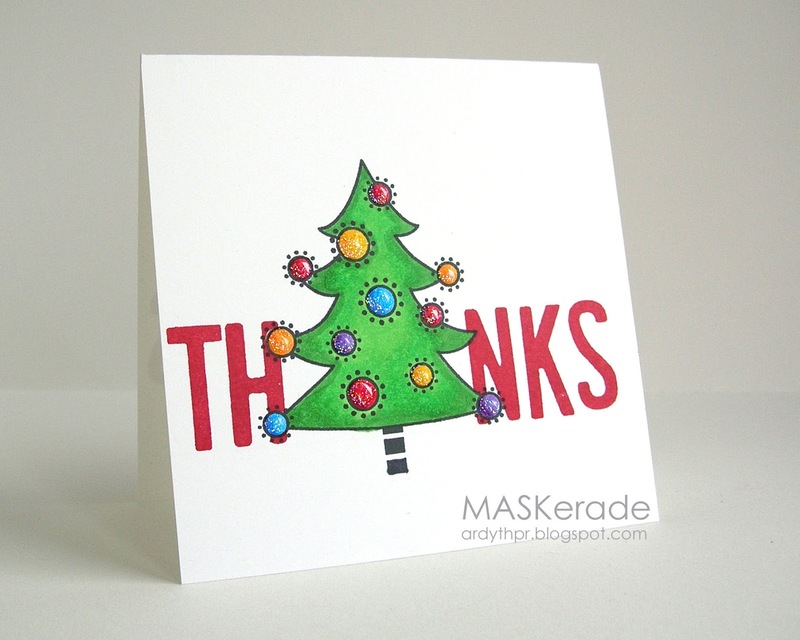 Your card just shined in the gallery, I do love the first one, that was a fun surprise when I got to your blog! Supa FUN take on the sketch! LOVE how you used the tree as the panel, it's so clever! Love how each card has such a completely different feel to it. They're both adorable but I love the crispness of the first one! Clever cards and what a fantastic idea for the green A. Love both cards Ardyth! Ack! A Christmas tree "A" ... of course! Why haven't I thought of this?! Ardyth, you are such a clever, clever girl! I adore your ability to look at a sketch and come up with the unexpected. This is absolutely darling! Thanks so much for playing with us at CAS(E) This Sketch - we're so glad you did!